Monkeys Grasp for the Moon is a suspended sculpture designed specifically for the Sackler Gallery by Chinese artist Xu Bing (born 1955), as part of an October 2001 exhibition of his work titled Word Play: Contemporary Art by Xu Bing. 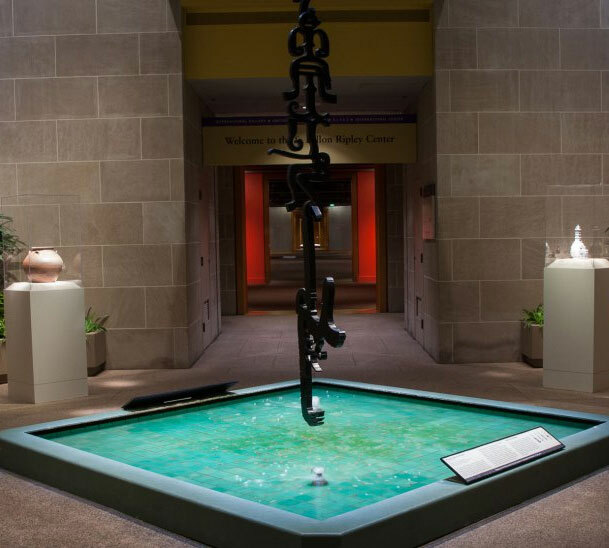 The popular temporary display was re-created to permanently remain at the Sackler, with craftspeople from the Smithsonian’s Office of Exhibits Central working with Xu and Sackler staff to engineer and fabricate the complex artwork. Composed of twenty-one laminated wood pieces, each of which forms the word “monkey” in one of twenty-one languages, the linked vertebrates flow from the sky-lit atrium through the Gallery’s stairwell down to the reflecting pool on the bottom level. A panel on every floor of the museum guides visitors through the represented languages, which include Indonesian, Urdu, Hebrew, and Braille. The work is based on a Chinese folktale in which a group of monkeys attempt to capture the moon. Linking arms and tails, they form a chain reaching down from the branch of a tree to the moon, only to discover that it is a shimmering reflection on the surface of a pool lying beneath them. Xu Bing’s monumental sculpture is presented by the family of Madame Chiang Kai-shek (Chiang Soong Mayling, 1898–2003) in commemoration of her historic visits to the Joint Session of Congress in 1943 and a memorable return to the U.S. Capitol in 1995.